Preparations are fully underway for Sinfonia Chorale’s forthcoming 50th Anniversary Concert on Saturday 11th March at 7.30pm in Southwell Minster NG25 0HD. 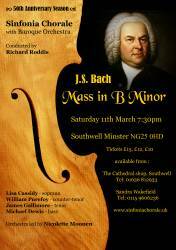 This performance of Bach’s Mass in B Minor promises to be one of the highlights in the musical calendar for 2017. It is a monumental composition which never fails to inspire the listener. We have a magnificent line-up of soloists along with the Baroque Ensemble (Leader Nicolette Moonen). As usual, the Conductor will be Richard Roddis. As usual, we look forward to seeing you there.